Laboratory Rabbit Diet is a Constant Nutrition™, complete life-cycle pelleted ration for rabbits. Unlike many rabbit diets, Laboratory Rabbit Diet is manufactured only at our drug-free Special Diets plant, and is recommended for reproduction, lactation, growth and maintenance. 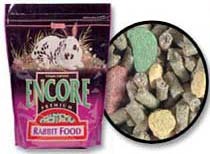 Bunny Basics 15/23 is an alfalfa-based pellet created especially for the specific dietary needs of active young rabbits. Rabbits are strict herbivores and a diet high in fiber is essential for maintaining good health. Alfalfa hay is used to provide an optimized balanced protein source, containing the amino acids required for the growth and health of your rabbit. Bunny Basics 15/23 can be fed to older rabbits having problems maintaining weight due to age or illness. When supplemented with free-choice grass hay, Bunny Basics 15/23 may also be fed to gestating or lactating rabbits. 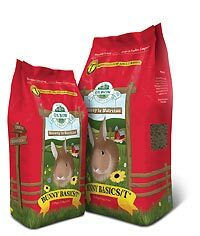 Made from timothy grass meal, Bunny Basics/T is specifically designed to meet the particular nutritional needs of adult rabbits. Adult nutritional needs are lower than those of animals in the growth stage of life. Rabbits are designed to eat and digest fiber found in plant material. Timothy grass hay provides the fiber necessary to maintain intestinal health, and makes Bunny Basics/T the veterinarian's number one choice for your adult rabbit. Supa Rabbit Excel® Junior & Dwarf is a complementary premium rabbit food for junior rabbits (less than 16 weeks), pregnant and lactating does, as well as dwarf breeds. The nuggets are of an ideal size and are nutritionally balanced; designed to be fed with good quality roughage, such as Supa Forage Excel® or hay, which should always be freely available. 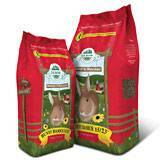 Supa Rabbit Excel® is a veterinary recommended fully extruded food for nutritional balance. All of the nutritious ingredients are blended together and then extrusion cooked into easily manageable pieces, so that rabbits eat all the food. It is high in fibre and digestible fibre and is very low in starch content - and as the small amount of starch is cooked, it is easier to digest. Supplemented with minerals and vitamins, it also includes the correct calcium to phosphorous ratio. Sluis Superior Menu Rabbit Food is a balanced and complete nourishment that meets the specific dietary requirements of your rabbit. Composed of ingredients selected for their taste and nutritional value. Sluis rabbit food contains Omega 3 fatty acids for extra resistance, healthy skin and a shiny coat.